Two Shaull brothers and a sister were very early Bronaugh residents. They were children of John Bartholomew and Rebecca (Bell) Shaull and were born in Virginia. The 1850 census showed the Shaull family living in Jefferson County, VA.
John and Lucy lived in Bronaugh by this census. 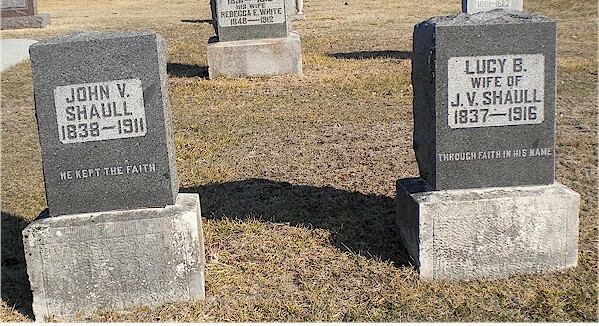 John Valentine Shaull died December 26, 1911 in Bronaugh. His death certificate showed a birth date of November 4, 1838. He was buried in Worsley Cemetery. Lucy Shaull died July 6, 1916 in Bronaugh. Her death certificate says that she was born December 15, 1837, the daughter of Nathan and Mary Grantham Barnes. W. D. Konantz of nearby Arcadia, KS was the undertaker and burial was at Worsley. 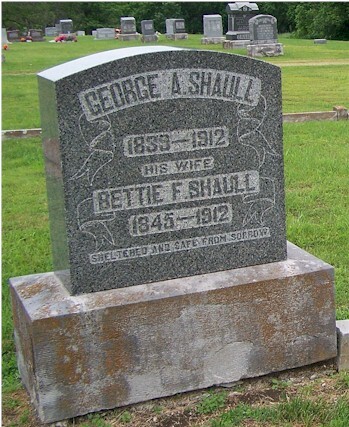 George A. Shaull (1839 - 1912) and his wife Bettie F. (1845 - 1912) are buried at Worsley Cemetery. George was an ex-confederate soldier, Company B, 2nd Missouri Cavalry. George A. Shaull married Sarah E. Hartman on April 18, 1879 in Vernon County. Rev. J. C. Coss performed the marriage. Throughout her life, Sarah E. went by the name Bettie. George A. Shaull and wife were listed in the 1880 Barton County, MO census living in Barton City Township. This township is due south of Vernon County. The family was again listed in Harrison Township for the 1910 census. George visited the Jamestown Exposition and attended the Ex-Confederate Reunion at Richmond, Virginia in 1907. George and Bettie's farm was in Harrison Township. George was also a leader in the Bronaugh Methodist Church. George Abraham Shaull died May 10, 1912. His death record says that he was born September 20, 1840 to John B. and Rebecca (Bell) Shaull. W. D. Konantz of Arcadia, KS was the undertaker. Burial was in Worsley Cemetery. Bettie Shaull died just a couple of weeks after her husband on May 26, 1912 in Harrison Township. Her death certificate has her last name misspelled as Bettie Shaw so is a challenge to find. However, it tells that she was a born November 11, 1845 to Christian and Caroline Boyd Hartman. Informant for the information was Mrs. Ray Todd. See grave marker to the left. George and John V. Shaull's younger sister was the third family member to come to Vernon County. Mary D. (sometimes called Molly D.), was married to Wilson Hartman (brother to Bettie Hartman, George Shaull's wife). Mary Shaull Hartman's obituary is on the Hartman page.